​For more than a quarter of a century Kevin has been a successful Business Executive at an elite Fortune 50 Company. He has also been a Director at an industry leading software company. Kevin's experience in sales and operations will give you and your team unique experiences for your success. Kevin will teach you how to compete and how to put yourself and your team in position to differentiate yourselves from the competition and win in the market place. From his leadership experiences you will learn how to have confidence under pressure and how to demonstrate decisive and effective leadership. 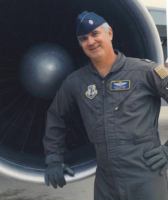 ​Kevin's real life story describes a combat mission during which the two engines on his left wing were totally ripped off in mid-air, in the darkness of night, while at maximum weight and on a combat mission. It is a compelling story illustrating how your team can overcome any obstacle facing them. He transforms the lessons his team learned into business examples for the benefit of your team. ​For their incredible aeronautical feat Kevin and his team were awarded the United States Air Force Distinguished Flying Cross. Kevin understands the value of being a great teammate before, during, and after the event when the Heat is On. Kevin is not just a leader of great teams, he truly understands teams. He will pass those words of wisdom to your team. Imagine getting the opportunity to sit in your living room and have a conversation with this gentleman who has been a leader of thousands of men and women. A man who successfully battled the physical loss of both engines on the left wing of his airplane during a night combat mission in Desert Storm! A man who led his college basketball team to it's highest ranking in history. A man who has achieved insurmountable success as a sales leader and corporate executive. Well...imagine no more. 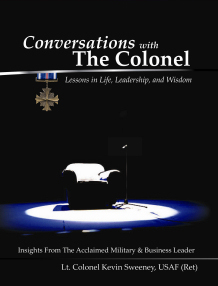 ​Kevin is the author of two captivating books: Pressure Cooker Confidence, How to Lead When the Heat Is On and Conversations with the Colonel, Lessons in Life, Leadership, and Wisdom. ​These books provide insights into the steps of proper preparation. You will learn how to develop a winning attitude. And you will learn the leadership tools required to give both you and your team a laser beam focus on the objective and the confidence needed to make you both successful. ​Kevin brings in-depth business knowledge to the stage for you to receive just as he delivered to his students as an adjunct instructor in the School of Business at Washburn University. He is up-to-date on the latest trends in technology and business acumen. He has also been invited and has appeared as a guest lecturer in schools of business in other universities. He received both a Bachelor in Business Administration and a Bachelor of Arts in Economics degrees from Washburn University. Kevin also received a Masters in Business Administration from the University of North Dakota.